ajgmets.net: RA Dickey ..Will He Win It? RA Dickey ..Will He Win It? 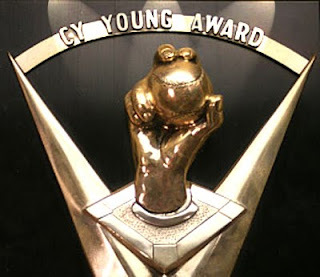 In my opinion RA Dickey should win the 2012 National League Cy Young Award in a close vote over the LA Dodgers Clayton Kershaw when the Award is presented tonight. That being said and the fact that I'm a Mets fan brings me back to reality and the continued heartache/ heartbreak I've endured for many years, here's a quick look at the top 2 candidates in my book. Dickey and Kershaw are basically tied in innings, WHIP, strikeouts and strikeout rate. Dickey had the more dominant stretch, which produced more complete games, and leads in strikeout-to-walk ratio, but Kershaw has a significant advantage in ERA and ERA+, one reflected in his lead in wins above replacement. As for their records, Kershaw received just 4.03 runs of support per 27 outs to Dickey's 4.76, which helps to explain why Kershaw's doesn't sparkle like Dickey's. I'd have a hard time arguing with a vote for either pitcher. Kershaw was slightly better over the course of the entire season, but Dickey's dominance from late May through the end of June was the most impressive sustained pitching performance in recent memory. Dickey is the better story and may break the virtual tie for a number of voters, but you have to be pretty hard of heart to complain about that, particularly given that Kershaw won the award last year and is 14 years younger than Dickey. Enough reality..Good Luck to both but more to Robert Allen Dickey of the New York Mets !!!!!! !